The words we speak about ourselves matters…. This picture is a jar that my daughter made for my birthday last year. 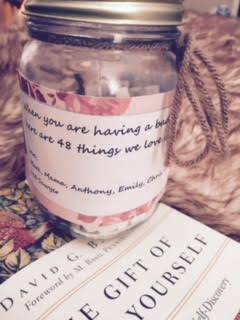 It says ~ When you are having a bad day and feeling blue here are 48 things we love about you~ She went around to everyone in my family and collected encouraging words that speak straight to my heart. It’s easy on the days when the inner voice is screaming and drowning out the voice of truth to believe the lies that seem so true at the moment; however, I don’t (and I’m sure you don’t) want to be stuck and weighed down by failures, disappointments, unfilled expectations. I want to cling to the power of truth. I want to see my goodness, even on the days when all I see is the “crazy” all around. Lord, may I speak well about myself. I want to see my value and worth. I am loved beyond measure. May Your truth overwhelm me today.